What an exciting time to be alive! How awesome it is to view the whole spectrum of human history from the panoramic perspective of God’s Word and to know what on earth is going on! And how wonderful to know that we have chosen the winning side in the spiritual battle raging all over the earth, giving us both HOPE for a bright future and PURPOSE for life today no matter the circumstances. It’s hard to believe we are near the end of this tumultuous year of 2012. What a ride! And as I write this letter from my heart to yours, I am extremely excited. No, not because I am celebrating Christmas five days early in case the world ends on the 21st. Rather, it is because I am thrilled by the privilege of knowing: (a) God and Christ (b) the Truth of God’s Word, (c) so many fabulous believers like YOU, (d) that our Father and our Lord Jesus are doing all they can to help us make known the Gospel and bring life and deliverance to those who want it, and (e) all of the above!!! Of course there is an alternative to that mindset. I could choose to be unthankful, discouraged, dispirited, intimidated, and inert. I don’t know about you, but it is much easier for me to be upbeat when I am rubbing shoulders with enthusiastic believers. Often, when I feel down, someone helps lift me up. As we face a darkening world, let us light it up together. Who are your spiritual encouragers? Whom do you encourage? Face-to-face is indispensable, but Skype and phone fellowship work too. 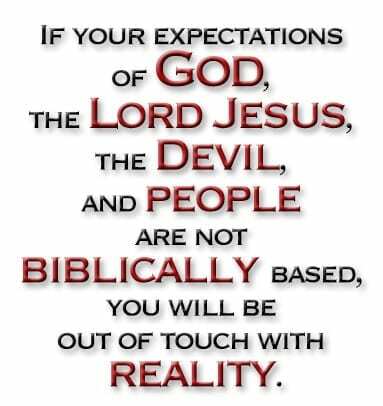 12 In fact, everyone who wants to live a godly life in Christ Jesus will be persecuted, 13 while evil men and impostors will go from bad to worse, deceiving and being deceived. That is why Paul exhorted Timothy as follows: “For God did not give us a spirit of timidity, but a spirit of power, of love and of self-discipline. So do not be ashamed to testify about our Lord, or ashamed of me his prisoner. But join with me in suffering for the gospel, by the power of God” (2 Tim. 1:7 and 8). OK, so we signed up to suffer. The more we realize that, the more urgently we will trust God/the Lord and the more prepared we will be for what is coming. Though it may still be grueling, at least we will not spiral into despair because our “great expectations” were dashed on the rocks of reality. Even now, there are many places on earth where Christians face the daily risk of dying for their faith. And those same forces of evil are at work right here in the good old USA to bring us to that point. I’ve already run for dear life, straight to the arms of GOD, So why would I run away now when you say, “Run to the mountains; the evil bows are bent, the wicked arrows Aimed to shoot under cover of darkness at every heart open to God. The bottom’s dropped out of the country; good people don’t have a chance”? But GOD hasn’t moved to the mountains; his holy address hasn’t changed. *He’s in charge, as always, his eyes taking everything in, his eyelids Unblinking, examining Adam’s unruly brood inside and out, not missing a thing. He tests the good and the bad alike; if anyone cheats, God’s outraged. *Fail the test and you’re out, out in a hail of firestones, Drinking from a canteen filled with hot desert wind. GOD’s business is putting things right; he loves getting the lines straight, Setting us straight. Once we’re standing tall, we can look him straight in the eye. 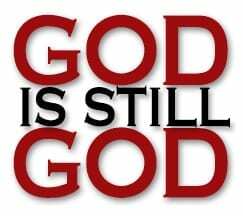 No matter the circumstances, GOD is still GOD! Amen! But did you notice the need for two giant asterisks? First, GOD is not “in charge” in the sense that He is either causing or allowing all that happens. He is not “Sovereign” in the sense that all things happen with His permission. When God gave mankind free will, He knew that man could use it to trash the world, and he has done just that. GOD IS NOT IN CONTROL. Rather, He is extremely angry about evil and He is doing all He can to stop it. He is also eagerly anticipating the day when the wicked will be annihilated—and that is what the last verse of the psalm refers to—when God’s justice finally prevails. Our hope is also His hope. NOTE: Given the RAMPANT ERROR in Christianity about this critical subject, you must be able to biblically articulate the indispensable truth summed up in this paragraph. Because of what we know from the Word about the Devil and his methods, we know there is a satanic conspiracy designed to enslave the world and that one day, after the Church has been taken out of here, his global government will be established—briefly. No matter how that conspiracy is playing out now, we must focus far more on the Truth of God than on all the wickedness going on. It is good to be knowledgeable about what the Enemy is doing, but people can too easily be overwhelmed by all the doom and gloom and make that the object of their focus. 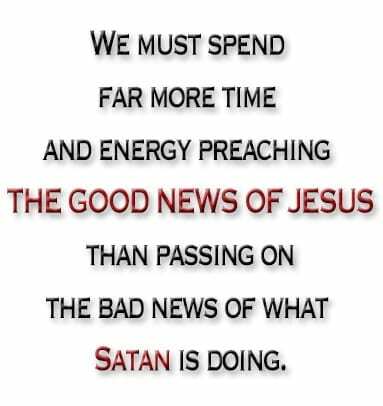 We must spend far more time and energy preaching THE GOOD NEWS OF JESUS than passing on the bad news of what Satan is doing. After all, our best weapon is the sword of the spirit, which is the Word of God, and we must speak it boldly. Remember the classic record in John 4 about what the woman who met Jesus at the well did after he spoke truth to her? Despite the negative cultural connotations that she was a woman, and one of questionable reputation, her testimony about Jesus basically turned on the whole city! If we do our part—boldly proclaim God’s Truth—we can count on the Lord Jesus to do his part, that is, minister to the heart of each person who chooses to follow him. But they cannot choose if we do not give them the choice to hear and believe the Word. As members in particular of the Body of Christ, you and I can tap into our Lord’s love, his joy, his peace, his patience, his purpose, his courage, his determination, his zeal, his expectancy, and his commitment to trusting our Father no matter the odds against us. Those are only some of the fruits of the spiritual connection each of us has with our precious Lord. Despite our persistent humanity, these qualities are not out of reach for us. In Exodus 33:16, Moses asked Yahweh, “…What else [but the presence of God with us] will distinguish me and your people from all the other people on the face of the earth?” The more intimate we are with the Lord Jesus the more we radiate Yahweh’s goodness, the more “distinguished” we are, and the more easily those who are looking for light can find us. But they likely will not find us, or we them, if we do not SPEAK THE WORD. Speaking of light, our plan is to release ONE DAY WITH THE CREATOR next month, and we are working diligently toward that goal. Stay tuned for the January FRUIT OF D’VINE with details as to how you can order this exciting exposition of biblical truth. It is a tremendous tool you can use to present the magnificence of God’s Truth on a silver platter. We can’t wait for you to see it, and we think it is going to thrill your heart. I do hope that you are staying abreast of what this unique ministry is doing, and that you pray for us. PLEASE PRAY for our annual Board Meeting this December 5-9 in Austin, Texas, when our Trustees (Franco Bottley, Paul Knopf, Larry Larimer, Robert Witt, Larry Ramberg [alternate], and I) gather to discuss a myriad of topics related to how we can better serve the Lord and make known the wonderful Word of God with which we have been entrusted. We need your prayer cover. 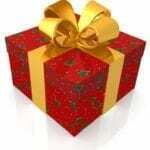 Have a blessed “Christmas” season celebrating the Lord Jesus Christ and remember that a merry heart is a holiday! This Christmas, be sure to give those on your shopping list the one-size-fits-all gift of TRUTH. I love you very much. See you in 2013! *Scripture quotations marked (NASB) are taken from the New American Standard Bible®, © 1960, 1962, 1963, 1968, 1971, 1972, 1973, 1975, 1977 by The Lockman Foundation Used by permission.